Kevin Smith was delayed getting from Oakland to Burbank Saturday night because he was "too wide for the sky." 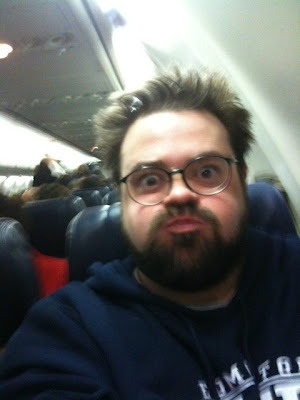 According to the 'Clerks' and 'Jay & Silent Bob' director's Twitter, Southwest Airlines removed him from a flight after deeming him a safety risk. "Dear @SouthwestAir - I know I'm fat, but was Captain Leysath really justified in throwing me off a flight for which I was already seated?" Smith tweeted. "I'm way fat... But I'm not THERE just yet," he continued. "But if I am, why wait til my bag is up, and I'm seated WITH ARM RESTS DOWN. In front of a packed plane with a bunch of folks who'd already I.d.ed me as 'Silent Bob.'" "Hey @SouthwestAir! Look how fat I am on your plane! Quick! Throw me off!" he tweeted along with the picture below. "The @SouthwestAir Diet. How it works: you're publicly shamed into a slimmer figure. Crying the weight right off has never been easier!" he continued. "Hey @SouthwestAir! I've landed in Burbank. Don't worry: wall of the plane was opened & I was airlifted out while Richard Simmons supervised." Southwest Airlines has a "customer of size" policy, requiring passengers to buy a second seat if they cannot fit between the arm rests. When extra seats are available these passengers are given refunds or relocated free of charge. The company has not ignored Smith's Twitter rant. "I've read the tweets all night from @thatkevinsmith - He'll be getting a call at home from our Customer Relations VP tonight," it tweeted. "Again, I'm very sorry for the experience you had tonight. Please let me know if there is anything else I can do."